Established in the year 2000, we, Jindal Groups, are one of the distinguished manufacturers, suppliers, traders and importers of a massive assortment of Yarn and Non Woven Fabrics. Our product collection encompasses Nonwoven Fabrics, Blazer Fabric and Shoddy Yarn that is applauded for its lightweight, skin friendliness, warmth, comfort, smooth texture and ease of maintenance. Our product collection is manufactured as per the latest market trends and in accordance with the industrial guidelines as well. We make sure that we are attaining complete satisfaction by providing the best quality possible within the time frame. We have established a world class infrastructure that is set up with advanced technology based machines and tools that help us in fulfilling the bulk requirements of our valuable customers. From time to time, our machines are upgraded so that we are able to deliver the superior quality products. To manage all the operations, we have hired an experienced team of professionals. It is because of the consistent efforts and exceptional products range, that we have established sister concern companies such as Shree Lakshmi Engineering & Woollen Industries, Shankar Woollen Mill, Shankar Lal & Company, Jindal Cotspin Pvt Ltd and Jindal Cotspin Pvt Ltd, Unit 1. 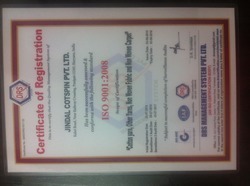 We are a private limited company under the leadership of Mr. Rochak Jindal and Mr. Vishal Jindal. His consistent motivation, vast industry experience and regular guidance have motivated us to attain our organizational goals. We wish to maintain our impressive track record in the upcoming future as well. Our product are importing all global. We are considered in the market to be one of the leading manufacturers, suppliers and traders of a commendable range of Yarn and Non Woven Fabrics. The finest raw materials used by us for its manufacturing, gives it a longer life and commendable strength. Post manufacturing, we process it through a number of quality checks for the purpose of eliminating defects. In addition, the strong packaging and timely delivery we offer, makes our products amongst the primary preferences. We are the preferred choice of our clients for the quality that we offer. We are extremely concerned with the quality that we offer and make regular efforts in achieving the best quality possible. The offered products are made using optimum quality raw materials imported from our dependable vendors. We make sure that all the products are manufactured within as per the existing industrial guidelines. It is because of the superior quality offered by us that we have garnered a large number of customers in a short time period. We have hired a team of professionals on the basis of their educational qualification, knowledge level and years of industry experience. These professionals work in co-ordination with the others and perform with the utmost dedication & hard work to understand and fulfill the varied requirements of our valuable customers. Our team is upgraded with the industrial advancements from time to time through seminars and training sessions conducted by us.